Asset Accounting in Simple Finance is used for monitoring of assets in SAP system. In SAP Accounting powered by HANA system, you have only new asset accounting available with new G/L accounting. As SAP Finance system is integrated with other modules, you can move data to and from other systems, i.e. you can transfer data from SAP Material Management to Asset Accounting system. You can directly post invoice receipt or goods receipt to the asset accounting component. You can perform advance functions for investment support and insurance. Financial Statement ─ You can perform and create consolidated group financial statements. 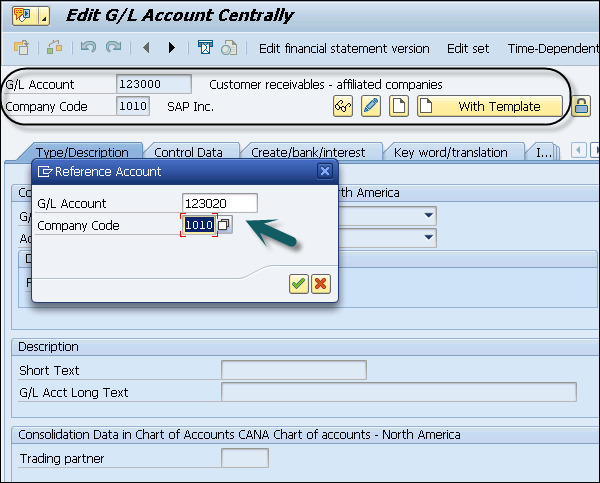 Step 1 − To create an asset account as statistic cost element, enter the Transaction code – fs00 and press ENTER key in SAP Simple Finance. Step 2 − In the next window, enter G/L account and Company Code. Click the With Template option on the right top corner of the screen. Step 3 − Enter the short and the long text under Description box. Navigate to Control Data tab to select it and clear Alternative Account No field. Step 4 − To save this entry, click the Save button at the top. To confirm the entry, enter the Transaction code /nAO90. Step 5 − Click Line Section-Int. and double-click Account Determination. Click Selection Line as entered in the previous window and Account Determination. Click Balance Sheet Accounts. Step 6 − In the next window, enter Balance.Sh.acct.APC value and press the ENTER key. To save the entry, click the Save button at the top of the screen. Step 7 − Again Enter the Transaction code /nfs00 and click the Change button. 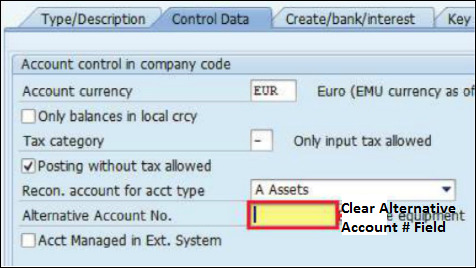 Step 8 − Select the Apply Acct Assignments Statistically in Fixed Asset Acct / Material Acct check box and click the Save button.